A day late again because, well, I actually like posting on Tuesdays. I’ll be posting Watchability Rankings on Mondays at Nylon Calculus anyway, and it’s kind of cool to already have a small percentage of non-conference games played out before previewing the week. Should the color scales be reversed? By point differential, the West ran over two wins worse than expected in Week 11 and nearly six wins worse over the last three weeks. Games against Cleveland, New York, Orlando, and Philadelphia are largely to blame. They aren’t the only East teams to lose against the West, but they’re getting squashed. How about Detroit with Jodie Meeks and without Josh Smith, though? Seriously, what the hell? They beat two-thirds of the Texas Triangle last week, which may or may not have an impact on the final East vs. West record, and they spoiled a huge Week 11 for the West. They are running super hot to where they remind me of this insane hand in poker. Also, the Atlanta Hawks are amazing. They snagged victories over the Clippers and Grizzlies which deserve more love than just two sentences. I am a terrible person for doing just that. 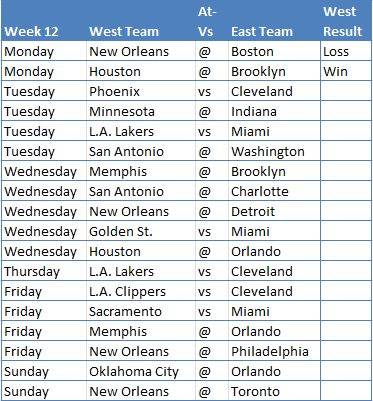 Houston (two non-conference games this week), New Orleans (four), Memphis (two), and San Antonio (two) take road trips out East while Brooklyn and Orlando play host to a couple of them. 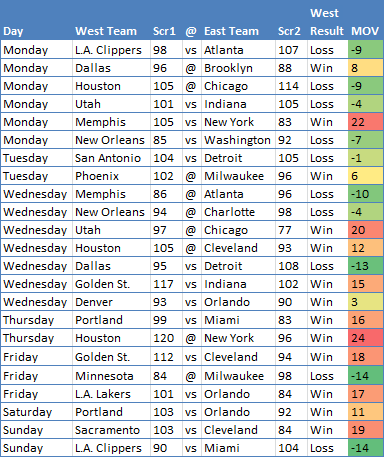 Miami and Cleveland also play three non-conference games this week, though they’re all on the road. It’s a crucial point in the season for both teams for a variety of reasons. Atlanta, Chicago, Milwaukee, and New York are absent which, for the most part, that’s not great for the East. Out West, the Pacific Division holds all of the West’s home games. They hold all of the cards, heh, or something. Not really, it just sounds cool, maybe.